The holiday season started off with a bang. Multiple bangs from neighbors of my quiet town of Blue Bell as I belted all the Xmas classics Mariah Carey's rendition of All of I Want Christmas to name a few) while my husbands runs off to his hobbit hole avoiding the misery of my singing. It was great - I sent Christmas cards off in November and had advanced to my second half gallon of eggnog. then all the horrific tragedies started in Oregon and then in Connecticut. My heart is heavy and I am no longer in the Holiday spirit. When I hear Wham's Last Christmas on the radio my fingers quick twitch the changer to something, anything sounding more like Nirvana's All Apologies. Although this is not the time (for me) to prance around like Blitzen, a salad with winter's sweet fruit, salty rich feta, earthy sage, and slightly bitter spinach shared with the one I love (my husband) reminds me not to take for granted the small things in life. Fry sage leaves in extra virgin olive oil. Remove from oil and lay leaves on paper towel. Arrange fruit on spinach, top with feta, almonds, and sage leaves. Drizzle with olive oil, add salt and pepper to taste. The sadness that your country feels has stretched across the world. It's just horrible to think what these families must be going through right now.. 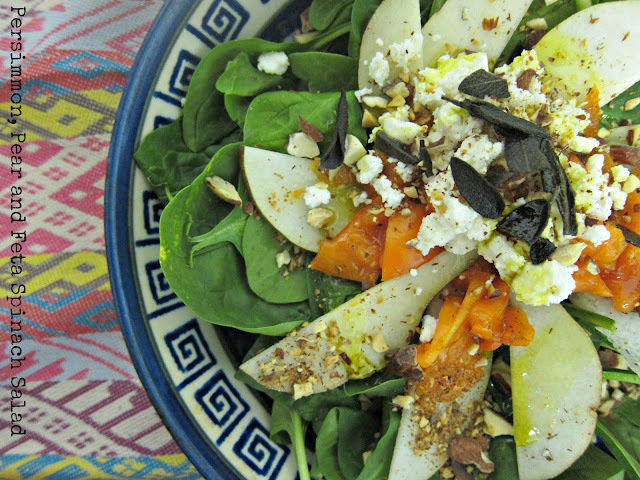 This salad looks beautiful Anna - pears and persimmon would make such a beautiful combo. Anna - So sad, thanks for your sympathy.